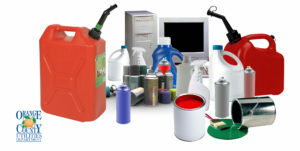 Orange County Utilities invites Orange County residents to a Household Hazardous Waste and Electronic Waste* Community Collection Event on Saturday, April 13, from 8 a.m. to 3 p.m. at the Orange County Services Building located at 475 W. Story Road in Ocoee. Participants will have the opportunity to properly dispose of hazardous and electronic waste – free of charge. Participants are prohibited from bringing biologically active materials, radioactive materials, explosives, tires, ammunition, fireworks, emergency flares, prescription drugs, or pressurized cylinders. *An item is considered electronic waste if it contains a circuit board. **Rear-projection TVs are not accepted. For more information, please call the Orange County Utilities Solid Waste Hotline at 407-836-6601, visit us online at www.ocfl.net/HHW, or send an email to Solid.Waste@ocfl.net.